The Squires Squad: Long Time No Blog! Sorry I haven't been very good at keeping up. But, it's been a crazy month with my dance company, drill team and of course family. Summer is near and I am sooooo happy to be done with school and even more happy to be done with pregnancy. 5 weeks and 3 days but whose counting. So here are some fun pictures from spring break that was a good month ago but we had a great time! 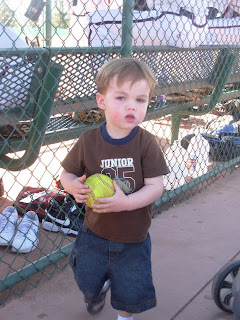 We went to St. George to cheer on my dad's softball team. Barry was dying because he couldn't play but he made a great cheerleader. 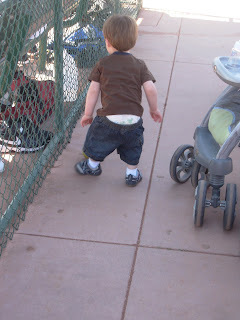 Andrew is already learning how all of his boy cousins show their undies!!! 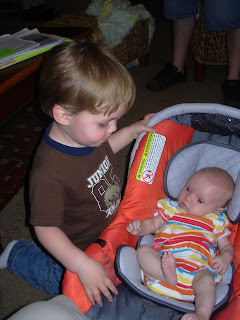 This is Andrew with his cousin Ruby. He talks about her non stop!!! He always wants to see her and if you ask him what someone or something's name is, he replies "Ruby." I still can't believe how big he is getting- and not to mention how adorable too! Holy toledo - Andrew looks just like you, Stace!! Crazy!! I wish you all the best with what is to come, you'll do great with all of it.